Once again, it’s the time of year we wait for all winter… Spring! While the planting and growing season is more than a month off, you can prepare now by cleaning up and preparing your lawn and gardens. If appropriate for our hardiness zone here in Stratford and Perth County (zone 5-6), plants, trees, and grass stand up fairly well to a blanket of snow and cold temperatures. However, conditions can fluctuate throughout the season which can stress exposed vegetation. This winter was a particularly icy one, so you may find more damage than normal, now that a lot of the snow has melted. We’ve been receiving a lot of calls already for those interested in our lawn and garden maintenance services, and we hope to start visiting customers in the very near future. However, if you’re a DIYer, here are some tips for preparing your landscaping for the upcoming season. Doing a bit of lawn cleanup and maintenance in the spring can help ensure a healthier lawn through the summer while minimizing weeds, so it’s definitely worth investing the time and effort. It’s important to rake your grass. You definitely want to clean up any leaves and debris that has accumulated over the winter. More importantly though, you want to rake deeply to remove thatch. If left intact, thatch blocks air, water, and nutrients from getting down into the soil. Before you rake however, ensure that your ground is relatively dry to prevent damage to the grass’ root system and avoid compacting the soil, which will happen if you walk on it while it’s wet. Compaction can be an issue as well. If soils are too compacted, air, water and nutrients are not permitted to get where they need to go efficiently. Aeration is the best way to remedy compaction. Be aware though that the soil cores that are pulled out of the ground during aeration can make a mess, so it’s best to keep lawn traffic to a minimum for a few days after it’s done. If you notice some bare spots in your lawn, you might consider overseeding. However, overseeding is best done in the fall, as crabgrass is much less of a threat after the first frost. So, consider either waiting until fall, or reapplying in the fall. Finally, you may opt to fertilize your lawn. If you fertilized in the fall, your lawn may still be digesting residual fertilizer. However, if you do proceed with a spring application of fertilizer, we recommend using a balanced fertilizer (20-20-20) which will help green up the lawn. In addition, the rhyzomes fill in the weaker areas and strengthen the root system. Of course, you can go the organic route as well, by simply top dressing your lawn with an even layer of compost. As with your lawn, the first thing you want to take care of in your garden is the removal of weeds, dead leaves and debris that’s landed there over the course of the winter. Not only does this make gardens and flower beds look better, but it drastically reduces opportunities for mold growth. 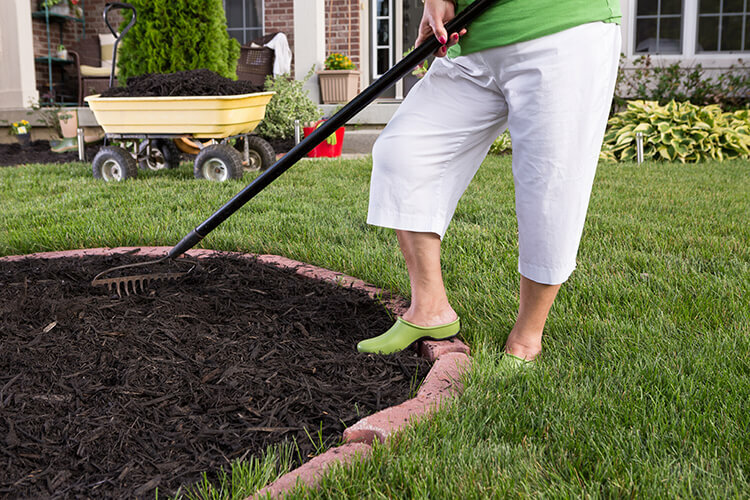 You can either remove by hand or lightly rake your gardens to eliminate surface debris. More stubborn foreign objects can be removed with a hoe or small trowel. After a good general cleanup, remove any wrap or covers that you placed on or over your trees and plants for the winter season. If you’re storing the covers, ensure they’re clean and dry before putting them away to avoid mold and rot from setting in while in storage. Check plants and trees for damage. Treat or prune away damaged parts if possible, or remove the entire plant if it didn’t overwinter well. Some pruning might be necessary in the spring, but ensure you know the appropriate time of year to prune the plants and trees in your yard. Pruning at the wrong time can negatively affect new growth, flowers, and fruit. Edging around flower beds is an easy way to increase visual appeal. It also helps keep weeds from creeping in. You can also edge your lawn where it meets the driveway and walkways. Once the risk of frost has passed, turn your soil with a shovel or small tiller to work in any remaining organic matter and to aerate the soil, which tends to get compacted over the winter. Then you can apply additional soil, compost, and/or amendments to adjust the soil’s pH or increase nutrition. Spring is a good time to divide your perennials, but be sure that you wait until the risk of frost is no longer an issue. Be sure to add soil and nutrients to backfill newly vacant garden areas as well as the areas you’re transplanting to. Finally, consider adding a layer of mulch to all of your gardens. Not only does it improve the look of your flower beds, it also insulates your soil against extreme heat, helps retain moisture, and keeps weeds at bay. All of these things can help you ensure a beautiful, healthy lawn and garden for what we hope will be a long, sunny season ahead. As always, if you’re not a DIY gardener or would like to leave yard maintenance to someone else, we invite you to contact us about our services.